Apple iPhone 7 was launched in September 2016. iPhone 7 features a 4.7-inch IPS LCD Display with 750 x 1334 pixels (326 ppi pixel density) and Wide Colour Gamut (Display P3) (DCI-P3). It comes with 2GB RAM and 32, 128, 256GB storage options and is powered by the Apple A10 Fusion chipset. Apple iPhone 7 runs iOS 10 and above versions of the OS. 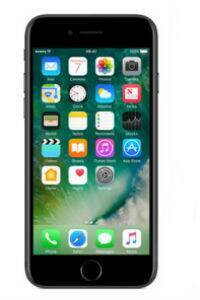 Apple iPhone 7 features a 12MP rear camera with f/1.8 aperture and Optical Image Stabilisation (OIS), PDAF, quad-LED (dual tone) flash. The front camera is 7MP. The rear video camera supports 4K recording at 30fps, 1080p at 30/60 fps and 720p at 30 fps. In slow-motion, it supports 1080p at 120 fps and 720p at 240 fps. Apple iPhone 7 has a non-removable Li-Ion 1960 mAh battery (7.45 Wh). Sensors on the iPhone 7 are: Fingerprint (Touch ID), accelerometer, gyro, proximity, compass, barometer. Connectivity options include: 802.11a/b/g/n/ac Wi‑Fi with MIMO , Bluetooth 4.2 wireless technology and NFC (only Apple Pay). Dimensions of the iPhone 7 are 138.3 x 67.1 x 7.1 mm. iPhone 7 has a redesigned home button with haptic feedback. Apple has done away with the 3.5mm headphone jack in the iPhone 7 series. iPhone 7 is water and dust-resistant and comes with an IP67 rating. The new phones come in five colour options – Black, Silver, Gold, Rose Gold and Jet Black. The Jet Black colour for the iPhone 7 is only available with the 128GB and the 256GB versions of the phone. iPhone 7 32GB retails at Rs 60,000 in India, while the 128GB version is priced at Rs 70,000, and the 256GB version costs at Rs 80,000.